Tips and facts about dog bites. Children make up 60 percent of the 4.7 million Americans bitten by dogs each year. Plastic surgeons, certified by The American Board of Plastic Surgery, repair thousands of children’s injuries from dog attacks. Children who are attacked by dogs are frequently bitten on the face, which can result in severe lacerations, infection or scarring. Because children are still growing, plastic surgeons take special care when repairing the skin and tissue on the injured child’s face. They also provide added assurance that the wound will heal properly, with as inconspicuous a scar as possible. Nearly 20 people a year die from dog bites in the U.S.
Every 40 seconds someone in the U.S. seeks medical care because of a dog bite. About half of all children in the U.S. will be bitten by a dog by the 12th grade. 70 percent of dog bites occur on the dog owner’s property. 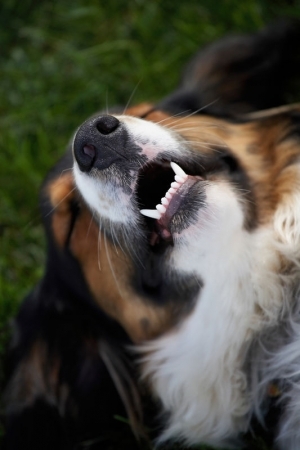 While any dog can bite, the top biting breeds include: Rottweillers, Pit Bulls, German Shepherds, Huskies, Doberman Pinschers, Chow Chows, Great Danes, St. Bernards and Akitas. Never run from or scream at a dog. Be “still like a tree” when an unfamiliar dog comes up to you. If a dog knocks you over, roll into a ball and stay still. Tell an adult if you see a stray dog or a dog acting strangely. Don’t look a dog right in the eye. Don’t play with a dog without allowing it to see and sniff you first. Control the bleeding and wash the bite area with soap and water. Get medical help immediately to determine the risk of infection for rabies. Because serious dog bites can cause scarring, be sure to ask in the emergency room for a plastic surgeon certified by the American Board of Plastic Surgery. This ensures that the doctor is uniquely qualified to perform reconstructive and cosmetic procedures on the face and all areas of the body. Never leave infants or children alone with any dog. Train your dog in obedience. Don’t play aggressive games with dogs. Keep your dog healthy; an unnoticed injury can make a dog aggressive. Remember your dog should be part of the family. Unsocialized “outdoor” dogs are more likely to bite than dogs that socialize with people. The American Board of Plastic Surgery has developed the Beware the Bite! outreach program to educate the public about the issue of dog bites and how to prevent them. For more information, visit www.plasticsurgery.org or for a physician referral, call (888)4-PLASTIC.